Though my twin sister and I have the exact same DNA, we have our differences. Most notably in the shoe department. For example, she can sport Converse high tops, motorcycle boots, and in general, more tomboyish footwear with confidence and look great. When I put them on, confidence is not what comes to mind, even though in theory I look exactly like her. But I am still game to try, particularly with this season's cool lace-up boots. They look a lot like Dr. Martens, but less clunky and counter-cultural, and with designers like Saint Laurent, Jimmy Choo and Acne Studios offering their own renditions, there are many options to choose from, including these standouts from Rag & Bone, Madewell, Via Spiga, Walter Steiger, Vince and Eileen Fisher. 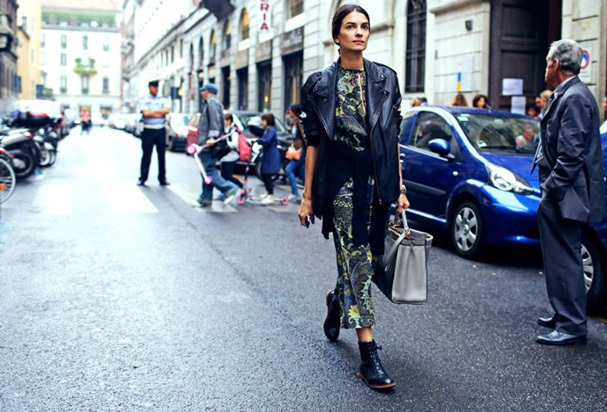 Leila Yavari, above, wears lace-up boots from Robert Clergerie. Love everything about this look! Those Clergerie's are amazing! Isn't it funny they all look like Dr. Martens? I wear them for nearly 20 years now and I always will!